Every day, the Doros choir performs Russian spiritual songs in Russia's best-known church, St. Basil's Cathedral on Red Square. 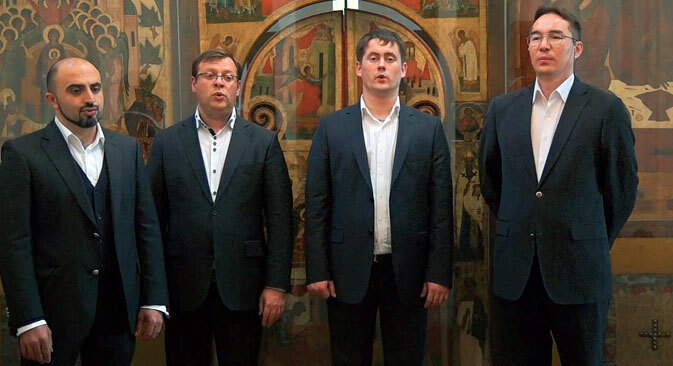 An RBTH correspondent met the singers to find out how they manage to keep up the ancient traditions of choral singing and what foreigners make of Russian church music. Under one of the domes of the iconic St. Basil's Cathedral there is a toy cockerel left by a four-year-old boy. One winter day, the boy's mother brought her son Petya on an excursion to the cathedral, where he heard Russian hymns being performed. The ensemble was singing the Lord's Prayer. Little Petya was so captivated by the singing that his mother could not persuade him to leave for a long time. He was sitting quietly, listening intently to the music. In the end, he presented the singers with his toy cockerel. The Doros ensemble, whose name translated from Greek means ‘spiritual gift’, performs at St Basil's Cathedral all day every day, with just several minutes' intervals between pieces. "We are real Russian men and we do not complain that our vocal cords get tired. When you do work like this, you need to have a strong core inside," says one of the choristers. Each of them has his own story of how he became fascinated with music, mostly starting from early childhood. The singers first met in Moscow over 12 years ago and began to work together. At first, they performed at the Novodevichy Convent and then moved to St. Basil's. "Each of us had a moment in life when we could have stopped doing music and could have started doing something else. But at one point we all met here," recalls singer Vruir Ananikian. Technically, it would be inaccurate to describe the choir as Russian. Vruir Ananikian is an ethnic Armenian who comes from Georgia; Yegor Chernegov-Nomerov is from the Urals, although he was born in Minsk, in Belarus. Yet they all consider themselves Russian and say that "being a Russian is not about blood, but about a way of life and mentality." "When you go abroad, you immediately feel Russian. Western spiritual music is meditative, while Russia music is real, at least that's the way I feel it. In an Orthodox Church service, everything is brought to the maximum: lavish robes, a majestic setting; everybody is dressed in their best and there is a festive mood," says Chernegov-Nomerov. Church culture, including choral music, began to develop in Ancient Rus from the 10th century onward. Tsar Ivan the Terrible, who ruled in the 16th century, was a great connoisseur of church music and even composed several pieces himself. It was in his reign that St Basil's Cathedral was founded. "For as long as there is the Russian Orthodox Church, Russian church music will live. Even when the state tried to destroy everything, still people continued to sing spiritual music, just replacing the religious texts with secular ones," says Doros tenor Alexander Gorbatov. A person coming to church often does not really notice how beautiful liturgical singing is. They are so lost in their thoughts and in the prayer that they do not appreciate the singing of the choir as a performance. For Doros, a prayer is primarily an emotional appeal - they try to live every song. "There are sometimes these magical moments that stir so much emotion. If we can sing in such a way so that a person does not just like it but there are tears in their eyes and they share in these moments with us, this is the best that an artist can experience," says Ananikian. After each performance, the singers are often surrounded by impressed listeners. "Come over and sing for us," says a woman from the UK. "Thank you, but we like it here," the singers reply. A female tourist from Germany, having listened to several pieces performed by the choir, says: "The Germans like this type of music but it is only a Russian who can truly understand it." Visitors to the cathedral come here with different tastes and different values in life, but everyone is captivated by the singing. "Once there was a truck driver in the audience; his hands were covered in motor oil. We were singing Kosolapov's "Confirm, O God". He had amazing eyes. He was standing there, looking at us like a child, unable to utter a thing," recalls the choir soloist. American actor David Duchovny, who recently filmed a Russian commercial, has also been here. During his visit to Moscow, he listened to the choir perform and was so impressed that he took a picture together with them. A while back, the singers of the choir were faced with the choice between following their vocation or ‘working’. The problem is that in Russia, doing music is rarely seen as work. "This is how we earn our living. Singing is first and foremost a craft and if a person is a musician and has to work outside music for a while, that means that he is in the wrong place," says Chernegov-Nomerov. The Doros singers confess that they sing even in sleep: "Some people fly in their dreams, while we sing. Artistic people have so much kindness, so much emotion inside. When I was on a tour in France, I once woke up hearing my two friends singing in unison in their sleep," recalls Alexander Gorbatov. The singers are disappointed that very often in Russia huge sums of money are allocated for some absurd projects in the name of art, while they are ignored. Still, they feel that they are in the right place and have no intention of leaving the country. Meanwhile, visitors to St. Basil's Cathedral continue to admire not only its beauty and splendor but also the enchanting singing inside.